Greetings! 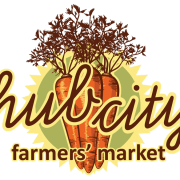 We at The Hub City Farmers Market are looking for enthusiastic volunteers who are eager to serve the Spartanburg community! We have various opportunities to serve and make a difference in the community in relation to access to healthy food systems. Urban Farm Volunteer - Aid in our harvesting and growing process of delicious veggies! Volunteers receive a chance to learn about urban agriculture practices and composting. Saturday Market Volunteer - Help with our Saturday Farmers Market located at in Northside Harvest Park. In the months of April - December. Volunteers get a chance to interact with Spartanburg's diverse community. As well as receive a chance to learn about food insecurity and the benefits of the farmers market in relation to the local economy and local business. Mobile Food Truck Volunteer- Volunteers will assist with mobile market stops in the surrounding Spartanburg community. The volunteer will have a unique chance to learn about how the Hub City Farmers Market aids in the increase of healthy food options in food deserts. The volunteer will also have a chance to engage with the community and build relationships with local farmers. Be physically able, energetic, possess a willingness to be helpful and adaptable. Ability to lift up to 50 Ibs.